After Jake suffers a streak of bad luck, he gets suspended from the NYPD. Jake thinks he's being sabotaged by a criminal he put away, so the Captain assigns Amy and Rosa to investigate the truth. 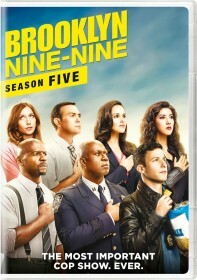 Meanwhile, Holt upsets Gina when he refuses to lie with Terry about attending her dance concert, while Boyle is stuck working with Scully and Hitchcock. Scully: You called us useless. You called us incompetent. You called us zeroes in the sack. Scully: Well, someone said it to me last night. Oh, must have been my wife. Hitchcock: All that investigating was exhausting. Besides, we did our share of that in the seventies and eighties. Now, we like to do paperwork in our comfy chairs. Scully: If we're away from our desks for too long, they'll update our computers and we'll lose Minesweeper. Boyle: I gotta say. You guys are good cops. Hitchcock: Yeah, no doy. How do you think we got to be the oldest guys here? Boyle: By never being promoted and losing all your money to divorces. Boyle: You're useless. You are completely useless. You are, without a doubt, the most incompetent detectives I've ever seen. And I am including that bomb sniffing dog that humps all the bombs. Jake: Rules are made to be broken. Amy: They were made to be followed. Nothing is made to be broken. Rosa: Spaghetti when you have a small pot. Jake is late for the Monday morning briefing because his power went out and his alarm clock didn't go off. Despite his promise to not be late again, on Tuesday, Jake rolls in late because his apartment didn't have any hot water. On Wednesday, Jake is late again after his car was out of gas and his laundry was stolen. When he shows up early on Thursday, Jake thinks his string of bad luck is finally over. Until, Captain Holt tells him he failed his drug test, with traces of cocaine and methamphetamine found in his urine. Jake tells the Captain he doesn't do drugs and that he thinks somebody is sabotaging him. Jake shows him the reception for filling his car up, proving somebody drained his tank. Captain Holt trusts Jake and doesn't think he'd do drugs, so he agrees to look into Jake's theory. Holt says he'll start an appeal with One Police Plaza, and assigns Amy and Rosa to investigate Jake's sabotage theory. Terry goes to Boyle to see if he's made any progress on the extortion case he and Jake were working. Terry tells Boyle that he's assigning more manpower to help him out, in the form of Hitchcock and Scully. Boyle is upset to be lumbered with the two worst detectives in the precinct. Later, Terry goes to Captain Holt's office to tell him that they missed Gina's dance recital the night before. Terry says he fixed things by lying to Gina and saying they were both there. Captain Holt is unhappy to have been included in Terry's deception. Jake gives Amy and Rosa a long list of people he's pissed off as potential saboteurs. Amy wants to look into the power and water shortage, questioning whether Jake paid his bills or not. Jake agrees to let them look through his bank account, and says he wants to help them investigate the case. Since he's suspended, Rosa and Amy tell him he can't work with them and should go home. When Rosa and Amy arrive at the urine analysis center, Jake is already there. Amy again tells him to go home. Meanwhile, when Terry sees Gina going to Captain Holt's office, he rushes over to stop Captain Holt from revealing the truth. Despite Terry's attempt to stop Gina talking to Holt, he tells her the truth that they both missed her dance show. Captain Holt tells Gina he considers her dancing a "hobby". After Gina leaves the office, she shreds her dance spandex. Boyle becomes frustrated as he tries to discuss the case with Hitchcock and Scully. Infuriated by their stupidity, Boyle accuses them of being the most incompetent detectives he's ever seen. As Amy and Rosa drive to talk to the super at Jake's building, he jumps up from the backseat. Rosa punches him in the face. When they wonder what he's doing, he says he hoped they were going to Rikers to talk to some of the convicts he's put away. Jake is insulted when Rosa and Amy admit they think there's a real chance nobody is sabotaging him, so he gets out the car and they leave him there. An ice cream truck rushes down the street and almost knocks Jake over. When the van door opens, Geoffrey Hoytsman, his ex-girlfriend's boss he arrested for snorting cocaine, points a gun at Jake. After tying Jake up in the van, Hoytsman accuses Jake of ruining his life by arresting him, even though Jake got the charges pretty much dropped. Hoytsman explains he got in a lot of trouble since then, leading to him being fired and losing his wife. After Gina mopes around the office after giving up her dancing, Terry and Captain Holt talk about her in his office. Holt doesn't understand why Gina, who usually doesn't care what anybody thinks, is so down about this. Terry tells him that Gina values his opinion. When Holt doesn't know how to make it up to her, Terry tells him to lie. When Hoytsman returns to the van after three hours away, he wants Jake to film a video confessing to framing him. After filming the video, Jake's surprised to read that he's now supposed to take his own life. Meanwhile, Hitchcock and Scully return to the precinct to tell Charles they've solved the case. After the way he criticized him, they were determined to show him they are good for something. After Jake headbutts Hoytsman, he tries to push the chair he's tied out of the ice cream van, but he ends up "turtling" on the floor. Hoytsman ties Jake up in the van again, angry he tried to escape. Meanwhile, when Gina posts a flyer saying she's selling her dance equiptment, Captain Holt admits dancing is more than a hobby for her, it's a profession. Captain Holt says she's a professional because he's going to hire Dancy Reagan for two shows for the at risk youths program. When there's a knock on the ice cream van window, Rosa pulls Hoytsman through the window and throws him to the ground. Rosa cuffs him and Amy tells him he's under arrest. Jake is relieved that they found him, but wonders how they managed to do it. Rosa says when Jake didn't do anything annoying for five hours, they figured out something was wrong. They checked out his annoying selfies and saw the ice cream van in a number of the pictures. They put out an APB and located the van. Back at the precinct, Boyle tells Scully and Hitchcock he was impressed with their work. Scully and Hitchcock don't want to be seen as good detectives. They tell him they did their share of the hard work in the '70s and '80s, now they'd rather sit back at their comfy desks and do paper work. When Jake returns to the precinct, Captain Holt tells him he's reinstated.